This topic will contain thoughts, ideas and feedback (non-bugs) from today's Public Playtest! Research branches, Like, research in better energy / power for your base, solar power, hydro power, maybe something from special fish species? Plant-researching / biology addition to the base, research new plants, grow salt deposits and quartz, research plants for better oxygen generation, get more self-sustaining and self-providing. Rough cut, will edit with further additions. Like a water-dispenser for filtered water, so there would still be a need for bleach to create disinfected water. My Addition: I really like this idea, so maybe add a wall mounted water dispenser that takes water from the outside ocean and filters it and makes it drinkable, with replaceable something something, so if you don't replace the necessary part, you get undrinkable water. Maybe a tube that just goes up so the lower dockingport of the Cyclops could be attached to the upper end, on the inside there would be just a ladder and the hatch on the top. My Addition: I was thinking like a charging station for your Seamoth, and then have the back mounted power cell for replacing if you are on the go, but when you are back at your place, dock your moth and let it recharge / repair? My Addition: I really like the idea of having an aquarium where you can not only breed fish, for "food farming" but also use the aquarium for "storage" to keep fish fresh. use of current gen. to generate energy from turbine generators, agressive fish in tanks producing energy, solar panels etc. Spooky, dark world as you go down very deep. A sense of more to the world. Pets. And Naming of your pets. Weather systems that can affect the ocean. Partially submerged caves, So you swim into them, and then they have air pockets. Charlie asked if people wanted more subs: The consensus was yes. Since i've mostly listened in on this i actually think i heard something about this but this is my ideas. 1: Instead of just making the base of tubes you should have a lounge / room. And also put a limit to this. Since the lockers take to have much space to be in place they are mainly in the way in the tubes so you can have thoose as dividers in the rooms. 2: As of the "waterwork" (in lack of better words) you can have a limitation to this so only 1 water per day can be "recycled" or farmed. 3: For the research part i've heard. Why not use a mechanized mini-sub which you can control from the research center. This aswell with limitiation but upgradeable. Like first upgrade 100m radius. The second 200, 3rd 500, 4th 1000. And that is final. 4: Related to 1;2. Oxygen center that takes up halv a room and has to be "fed" with seaweed to work. 1. When player enters his sub he can spawn in special area which do not have to be on the ship, thus can be modular. 2. Player can have "void locker" which upon use [like using ladder] will teleport him to mentioned location. And as those "torpedoes", i meant stasis type of defense for ships, not weapon of destruction. Sounds like a solid list of new features to consider. Wish i could have made it for the testing session. Sadly i'm a 9 to 5 working stiff. Maybe you could hold one session on a Saturday and just take a day off on Monday instead? I would really like a renewable source of power. It would be great to be able to recharge spent energy cells off a floating wind turbine or sunken geothermal generator. Alternative food recipes that didn't use salt would be appreciated too. Maybe fish combined with creeper or some other farmable vegetable for variety? Someone had mentioned that caught fish or other foods would deteriorate over time if not eaten. I suggested a refrigerator or freezer. I know Devs mentioned that the radiation was to keep players away from the ship in the short term, however I think it could be made into a game mechanic. For example, the player might need to develop a radiation suit to withstand the radiation in the crashed ship. Some kind of tech tree might be needed, special items to be found or made in order to craft the suit. I'd say at least a fair amount of difficulty to build the suit so that the player has something to work toward. 1) It looks huge, so I would think there would be a lot to explore. I can imagine a bunch of decks internally. Lots of nooks and crannies to find things in. Locks to unlock, safes, storage compartments, doors, etc. 3) Stronger materials for subs or creature defense. Maybe stronger stasis weapons? (I know the devs don't want to concentrate on combat). 4) More advanced power sources (Fusion reactors - can use water as fuel which would also generate hydrogen and oxygen (plenty of H2O after all)). 5) Maybe some kind of minor story component. Why ship crashed? How does it affect the player? Hints of intelligent life on planet? Some kind of possible link to endgame. I'm sure lots of other ideas can come out of the crashed ship. I also thought about more subs, maybe ones with roles for deeper diving. Hard to make, deeper they can dive, or maybe have a sub for mining. Fast sub for getting places, well, faster. Lots of possibilities here. I think eventually surface bases would be pretty cool too. Bases for both underwater and surface. I know you can build underwater bases on the islands currently, and that they leak/flood. I'll try to update as I think of new ideas. I remembered i mention the Harpoon yesterday but never got to finish saying what i meant it should be for. Yes it can be used as a tool to catch bigger fish from medium-range. However, my idea was to attach the harpoon to a sub and use it to move rocks. So you have a "tow-sub". I'd like to see in game ways to recharge your batterys as well. But I think that good think might be more customisations for seabases. I mean changing colors of lights arround, colors of hull, colors of lights inside, bigger rooms and aquariums with your trophys from hunting. Unfortunately I didn't make it in time for the testing, but maybe I can share a few ideas. I didn' read all the comments so please excuse if some things are already planned or mentioned above. # 1 - alternate/secondary power-generator. I thougt of some kind of fuel-cell-powered generator or water-powered (electrolysis). Like the common one is needed to power the constructor etc. inside the base and the basic water-powered generator just keeps the energy at 1% (like in the cyclops at the moment) so the oxygen-supply and light stays on but tech with a higher demand of electricity won't work without the power-cells. maybe you could add it to the walls of the base or to the end of a tunnel so maybe a third of the "i-Tube" is filled with the bed. So there wouldn't be a need for new forms of rooms. Small Lockers (I personaly use the T- or X-tube to store my lockers in the unused sections, but) I think there should be some smaller wall-mounted version maybe the size of the constructor (when unused) so you can place them everywhere without getting in the way Storage then maybe reduced to the amount of the small storage-container you can already construct. I think the salt should be removed from the recipes for cooked fishes. Instead there should be some decay for food. The salt should be used for dried-fish- or salted-fish-recipes that are edible for longer durations like 5-6 days maybe. If there will be a degrading of food added to survival-gameplay that would make more sense. Right now I think that fished catched in salt-water aren't in need to be salted before cooking anymore. The salt should be used for dried-fish- or salted-fish-recipes that are edible for longer duration's like 5-6 days maybe. If there will be a degrading of food added to survival-gameplay that would make more sense. Right now I think that fished caught in salt-water aren't in need to be salted before cooking anymore. Adding in some more fish we can eat raw without serous h20 penalties (sushi style) would be nice too. Being able to set up lobster style traps near our sea base would also be pretty neat in giving us a way to acquire food without having to hunt for it ourselves. While we're on the subject of food I do find it a little weird we can eat while swimming underwater at 200 meters. For survival mode it might make more sense to require us to be on the surface or inside a vehicle/building before being able to eat? 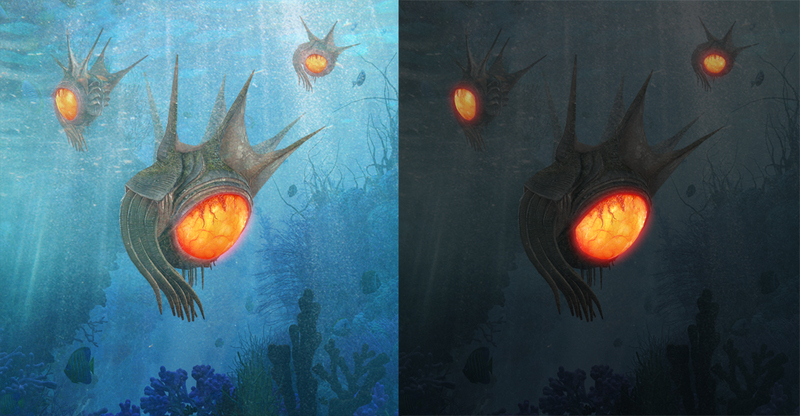 One thing that would be awesome to link NS2 and Subnautica! And that would be a great fanfavour! "Like all the other Kharaa structures, TSF scientists speculate that hives are actually creatures that have been evolved into this form over an incredibly long time, and have observed that Kharaa structures in general tend to resemble aquatic forms of life, contrary to the Kharaa lifeforms that clearly originated from mammals and other similar creatures." - add some of the Kharaa lifeforms BEFORE they where changed by the Kharaa! like the Hive, shade, veil, spure, cocoon, drifter,... underwater AND skulk, gorge, lerk, onos, ... on island and above water! it would be so AWESOME to see these creatures BEFORE they get mutated to hostile lifeforms by the Kharaa! so they will be more friendly in apperance! no long claws, spikes, ... storywise it would make perfect sense! - add a random Kharaa investation somewehere on the map that will slowly grow by passing gametime. changing the biom and the creatures living in it into more hostile forms! to counter it, add a feature to fight the Kharaa grow. this investation can be triggered by a worldevent like a meteor hitting the ocean or ...! - shouldn’t the hoverfish actually hover on the watersurface? - ability to sleep and restore health, rest and pass time! - what’s the point in repairing the escape pod? It should do something! - add a radiationsuit so we can get to the crashed ship! Everybody wants to do that! - add more rooms to the submarine, at least one more where u can rest, change outfits, look in ur ingame computer and so on, so u feel more at home in ur sub! great game so far, i love it allready. keep up the good work! ups, i realised i may be wrong here... better post it in suggestions! ?